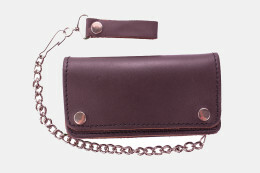 Before heading out on the next ride make sure you geared up right with Dream Apparels Leather Biker Wallet. 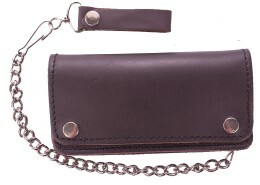 Our Biker wallets are equipped with heavy duty chrome steel chain and leather belt loop with snap closure so the most valuable items will stay cruising with you. 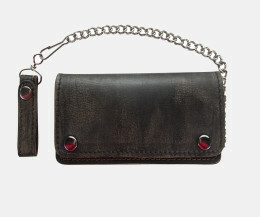 This bi fold wallet design has the classic USA flag patch sewn on front for the proud American biker. 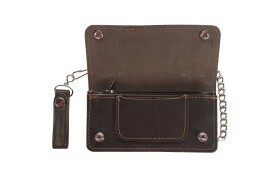 Inside of the wallet has 2 currency pockets, zipper pouch, ID or credit card pocket and hidden stash pocket. Secure your credentials or cash with snap closures so you can ride with piece of mind.